Crying kinder: "Art teacher! He pushed me!!" Me: "Why did you push her?" Other on-the-verge of crying kinder: "Because I'm number 7! She was in my spot!!" Let's be real people. We get this EVERY. TIME. KINDERGARTEN. LINES. UP. While I normally use moments like these as opportunities to teach students good manners (like saying excuse me instead of pushing someone over), wouldn't it be great if it didn't happen at all? What if we could call our students to line up and they immediately knew exactly where to line up to get into line order!? In comes line-up dot spots. 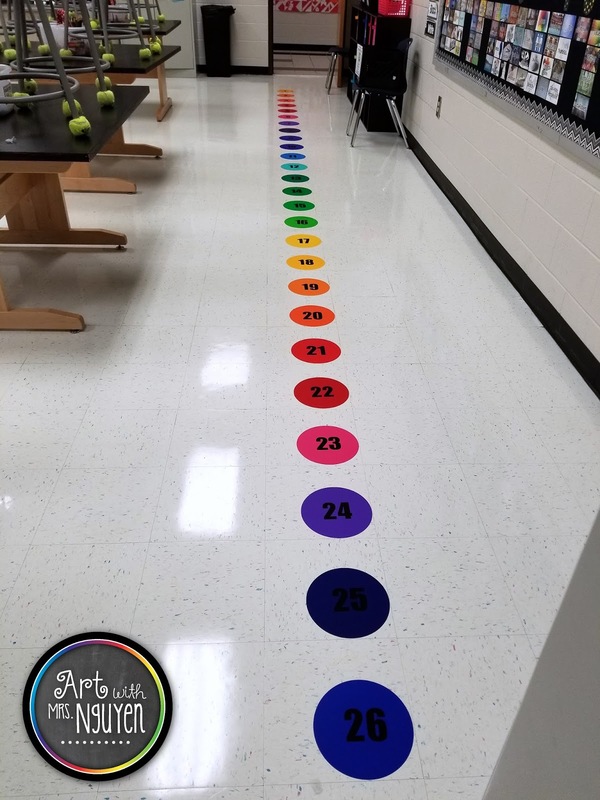 The best classroom management idea I've seen in quite some time! Special thanks to @2art.chambers and @mrsdow_artroom for the awesome inspiration! 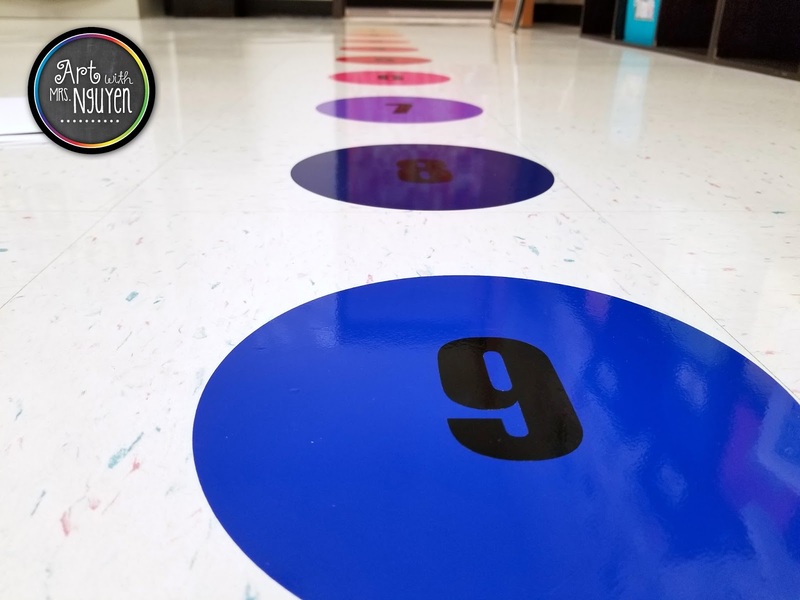 To make these beautiful floor spots I used some very colorful vinyl that I found on Amazon (of course). And to make it even better.. it's on Prime! 💕 **Update: Since writing this post the vinyl has become unavailable. It looks like this vinyl might be a good alternative (though I have not personally tried it). So two days after I placed my order, I received a package with 30 sheets of vinyl in a plethora of colors (including 3 black sheets - 2 glossy, 1 matte). My initial plan was to cut out the circles on my own but then my mom suggested that I use the Cricut that she had just bought. I gotta say - I LOVE the Cricut. It saved me SO much time cutting and to top it off - all the cuts are absolutely perfect (which is great for a perfectionist like me)! I cut out (okay the Cricut cut out) 26 8" diameter circles, a star for the line leader spot (which I forgot at home today), and then numbers for each spot. 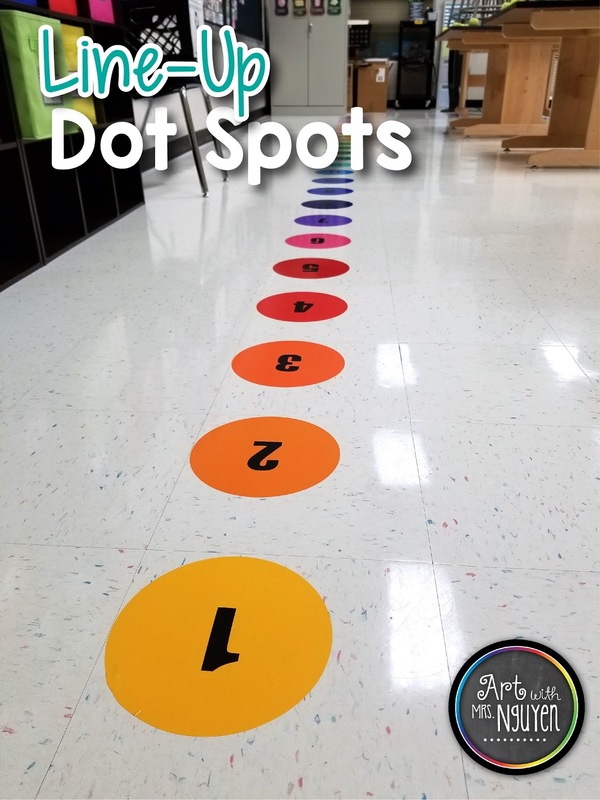 To install the spots on my classroom floor, I began by spraying the floor with rubbing alcohol (to help remove any oils or residues). 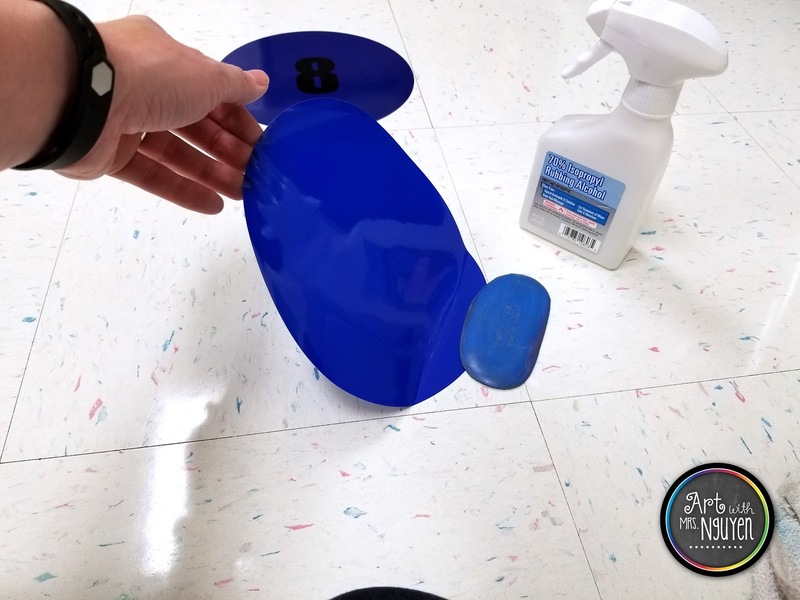 Then I peeled off each circle from its sheet and slowly lowered it onto the floor. To help reduce air bubbles, I used my rubber clay smoother to flatten the vinyl down gradually. Then once the dots were down, I just placed the numbers on top. The numbers were probably the most frustrating part of the whole project. Getting the two-digit numbers aligned to each other and in the center of the dot was tricky. I literally just did this same thing last week. It has been incredible with all of my classes! I did have to add a star for line leader rolls/star students in the classrooms. I made a star too. I just keep forgetting it at home. Haha one day it'll get there! I have always done a tape line. HOWEVER the whole(in my number spot) has become an issue the last few years. I think I will try this! How do you assign numbers... I have 20 classes! That's a lot to keep track of!